The Omaha Sunday Bee, July 12, 1908 | The McKeen Motor Car Website The Omaha Sunday Bee, July 12, 1908 | The Compendium of Knowledge on the McKeen Motor Car Company, and their experiments. 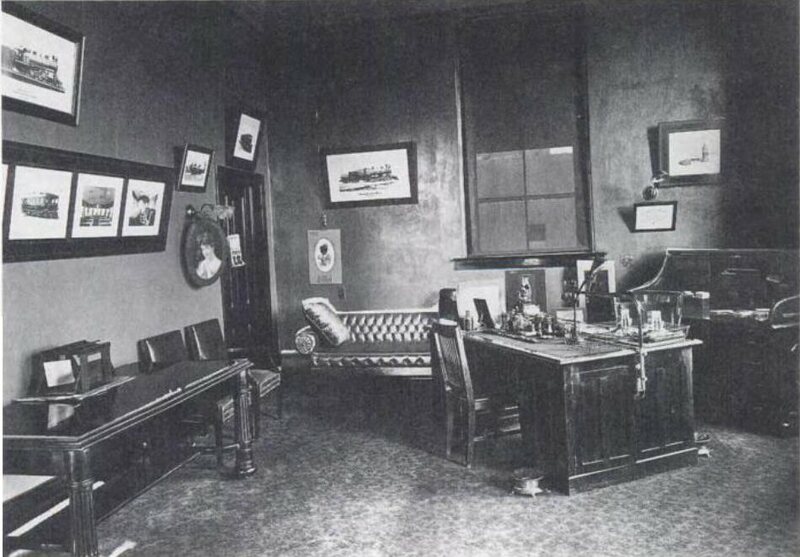 A man with black hair, heavy black beard, keen, large, kindly grey eyes and a salient nose, leans back in a swivel chair with his back to a roll top mahogany desk in one corner of a large private office in the south end of the Union Pacific shops office building. The office boy has just told you to go in and your feet sink into the thick carpet as you step across the room. Between you and the man in the swivel chair is a large, highly polished mahogany table, upon which are all manner of strange devices. There is a model of the Paxton & Mitchell high pressure piston stem packing; a model of the Westinghouse friction draft rigging; a model of the Sessions draft rigging; a model of the Hall and Kilburn seat end. Upon the walls are pictures of pretty women, pleasant landscapes and photographs of railway motor cars, steel box cars, steel passenger coaches. It is really a very fine office. Everything has a place and is in Its place. The man behind the polished table fits right into this picture of pleasant orderliness. His gray business suit and pleated pink shirt bespeak the carelessly careful man. He seems to have nothing special to do except to swing in his swivel chair and tap the mahogany table with a paper cutter. Notwithstanding the picture given above, reference Is not made to Governor Hughes of New York. The beard truly is the beard of Hughes, but the voice is the voice of William Riley McKeen, lieutenant on the staff of E. H. Harriman, captain of the mightiest Industrial army the world has ever seen, ruler over a railroad empire greater than Alexander ever dreamed of, genius of the modern commercial world. A large part of the success of great men is due to their ability to recognize the genius of other men and to attach such men to themselves. Mr. Harriman possesses this ability to a marked degree. He has surrounded himself with the best men in their several special lines. And William R. McKeen Is recognized today as preeminent in the mechanical world. A large part of the fruit of his genius accrues to the great railway system of which Mr. Harriman Is the head because Mr. Harriman discovered him and made it worth his while to devote himself to the Union Pacific lines. The gasoline motor car, the steel box car, the steel passenger coach these are three of the great achievements of Mr. McKeen, any one of which alone would make the fortune and fame of a man. They are three of his achievements strictly within the limits of his profession. But he is not bound by those lines, a will be explained hereafter. This young man who has been for six years Superintendent of Motive Power and Machinery for the Harriman systems covering more than 30,000 miles of busy railroad track, has not yet reached his thirty-ninth birthday. He was born October 2, 1869, in Terre Haute, Ind., and is the son of William Riley McKeen, for twenty-seven years president of the Terre Haute & Indianapolis Railway and one of the prominent men of the Hoosier state. His grandfather was also president of this railway. The family Is of Irish-Scotch extraction and the paternal ancestry extends to Thomas McKeen, a signer of the Declaration of Independence. Though he was born with the proverbial silver spoon in his mouth, he was of a stock which was not spoiled by a mere unfortunate circumstance like that. During his early years he was under the tuition of a governess at home. At the age of 9 years he began to attend the public schools in Terre Haute. Two years later he entered the high school, whence he entered the Rose Polytecnic Institute at Terre Haute. After a four years’ course he graduated from there in 1889 with the degree of bachelor of science. He entered Johns Hopkins University, Baltimore, taking the advanced mathematics and the regular course in electricity. He took the first and second year’s work at the same time and finished both within a year. He then went to Europe and from July, 1890, until the fall of 1891 he pursued his studies in electricity and mechanical engineering at the Polytechnioum in Berlin. As Peter the Great learned shipbuilding by visiting the dockyards of Zaandam and Deptford, so this young American learned his profession by practical observation in the great railroad and machine shops of the principal cities of Europe. The scene now changes from the drawing room of the first act to the attic of the second, for this educated and polished son of a wealthy and prominent house came back to America and secured work as an apprentice in the car shops of the Pittsburgh, Cincinnati, Chicago & St. Louis railway, at Columbus, O. For his first month’s services be received $26.80. But that apprentice in greasy overalls only ten years later was superintendent of motive power at the greatest railway system in the world. What had wrought the miracle? Ask the question of the genial, approachable man who seems to have nothing to do bat sit behind the polished mahogany table and beat a tattoo with the paper cutter. He will think a moment in accordance with the orderly system which is characteristic of him, and when he has reduced his thoughts to consciousness he will answer: “Determination without conceit.” It requires bat a short look at the accomplishments of McKeen to prove that this Is precisely the recipe which has brought him success. The physiognomist [A person supposedly able to tell characteristics of a person by their facial features] could have told by a chance at that salient nose and firm jaw that determination was a part of the McKeen makeup. But his works show still more conclusively what determination has done. As the touch of King Midas turned everything to gold, so his touch seems to have turned everything to success. And this Is true not only in railroad undertakings, but in either ventures wherein he has Interested himself. He made so good a record with the road on which he served his apprenticeship that in 1893 he had already risen to be master car builder of the Terre Haute & Indianapolis Railway, and soon after that he was made general foreman of both the car and locomotive shops of the same road. There he remained with signal success until 1898, when he became vice president of the Prox-Brinkman Manufacturing company. About the same time he formed a company and purchased the Terre Haute Express, a daily paper. He was made president of this company and chairman of the board of directors. The paper had never done anything but lose money, yet in Its first year under the management of this railroad man It paid a dividend. However, his Inclination for railroad work was so strong that in December, 1898, he accepted an offer from the Union Pacific to become district foreman at North Platte, Neb., a position which he held until May 1, 1901, when he was promoted to be master mechanic of the Wyoming division of the Union Pacific, with headquarters at Cheyenne. He remained in this position until June 15, 1902, when he was promoted to his present position, superintendent of motive power and machinery. Only men of little minds and small accomplishments have room for conceit. 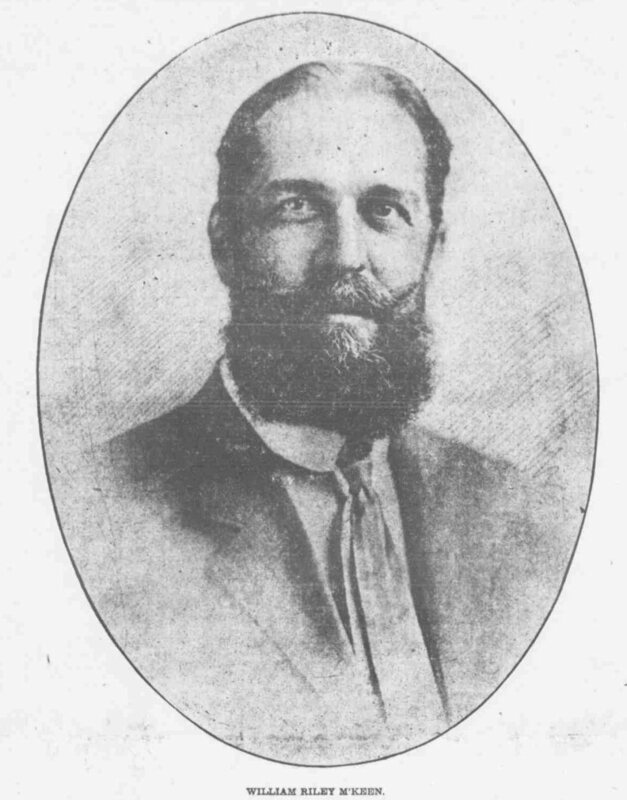 William R. McKeen’s lineage, the wealth and position of his family, his own education and natural qualities might give him excuse or conceit. But he has none of it. And this is the negative quality which be adds to the positive quality of determination as a requisite for success. This lack of conceit makes It easy for him to mingle with the humblest of the men under him. a thing which he does every day. He knows hundreds of them personally and calls them by their first names. It is a common sight to see the superintendent of motive power and machinery of all the Harriman lines earnestly discussing a problem with a begrimed workman in overalls, and If the problem Is especially knotty the grimy workman may perhaps step into the private office and sit on the other side of the table of polished mahogany. McKeen has always been very close to the men, not only in their working hours, but even during their hours of recreation. Down at the shops he is pitcher of the office base ball team, which frequently crosses bats with the team made up of men from the shops. His life at North Platte was characteristic of the manner in which he treats men. He hadn’t been there a month before the quiet little town, most of whose citizens worked too hard to even think of getting up some pastime, discovered that a new force was there. William R. McKeen, the new district foreman, was this force. He soon had a baseball team started of which he was manager. Then he organized the Buffalo Bill Gun Club. He encouraged the building up of a brass band. He helped promote street fairs and other means of amusement and recreation. The result was that the men who worked for the railroad came to like the town. They got interested in the base ball club and in winter the band and the Gun club kept things lively. Boilermakers who rarely kept a Job in the little town three months before being attacked by ennui and wanderlust stayed as long as McKeen was there. “I try to treat my men like men should be treated; like I would want to be treated if I were in their place,” says McKeen. “I know my men at play as well as at work. I believe that all work and no play makes Jack a dull boy. Eight hours a day is as long as a man ought to work. There’s nothing worth noticing in this talk of some self-ma- men who worked sixteen hours a day to make themselves. “Moreover, I believe in taking care of the health of my men, and also of making their surroundings as beautiful as possible. Landscape gardeners are not the only ones who can appreciate green trees and pretty flowers. With pleasant surroundings, pure air and proper hours of labor any man Is worth more to his employer than under adverse conditions.” McKeen has carried out his ideas at the shops. In the blacksmith shop, for example, he has installed four systems of ventilation for the benefit of the lungs of the men who work at the forges. In the new office building he has placed a system of ventilation which Is his own Invention, admitted now by ventilation system manufacturers to be superior to their own. On the shop grounds there are beautiful lawn plots, shrubbery and more than 1,600 young trees, which in the ‘course of a few years will convert the place into a veritable park. Men are constantly employed in caring for the park system of the shops. Also that rule which Is so evident in McKeen’s private office is in rigid effect all over the shops. It is a rule which careful mothers teach their children, “Have a place for everything and everything in place.” Everything in this vast workshop, down to the smallest nut and bolt, has its appointed place, where It remains unobtrusively out of the way until it is wanted, and then no time is lost hunting for it. “Ugly surroundings and slovenliness have a depressing effect on men,” says McKeen. “From the economic standpoint, to say nothing of the humanitarian, this orderliness, this ventilation, this parking of the grounds is good. Moreover, every man has a good locker where he can put his clothes and valuables and know they are safe. And there are shower baths just as good as those at the country clubs, where, after the day’s work, the men can take a bath and rubdown and go home feeling like men.” Such treatment is appreciated, and therefore it Is clear why McKeen has all his men with him, striving toward his ends and working as a powerful unit with him. That is one of the reasons why he has done so much. 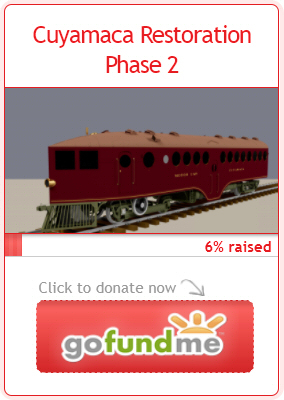 Take the history of his greatest accomplishment, the gasoline railway motor car. Mr. Harriman, touring France in 1903 with his family, took notice of the gasoline automobile in which they were riding. He decided he could use something like that in some parts of his railroad empire. Returning to the United States he ordered car and locomotive builders to make him a gasoline motor car for railway use. They tried and failed. Then Harriman “put It up to ” young McKeen in the Omaha shops. McKeen called together his staff of engineers and experts and placed the proposition before them. He did this thing one day at lunch, for he has instituted a lunch room in the office building, where he eats every noon at a big table with thirty-five of his engineers, foremen and experts and discusses salient questions. After lunch that day, as usual, the men played ball for half an hour and then, refreshed, according to the McKeen regime, this great composite brain “got busy.” The result was that on March 28, 1905, motor car No. 1, marking an epoch in railroad car building, was turned out from the Union Pacific shops. Such a success was this car that twenty-four have been constructed since, seventeen are now in course of construction and a million-dollar corporation has been formed, with Mr. McKeen at the head of it, for the exclusive purpose of manufacturing the cars which are being demanded by all the railroads of the country. Since the manufacture of the first car great improvements have been made. The seating capacity has been Increased from twenty-five to seventy-five, the horsepower from 100 to 200. The mechanical world’s attention has been attracted by the wonderful steel shapes in railroad construction which McKeen has introduced. The Union Pacific steel box car constructed by him is all of steel and has the remarkably light weight of only 38,050 pounds. In eighteen months’ trial It has proven its practicability and adaptability to the various kinds of lading. The small repair item Is a prominent feature of the car. The under frame is composed of one continuous center sill and two side sills, all of which are supported by depressed cross-tie members. The offered by the herring bone construction renders this steel structure practically indestructible. The light-weight all-steel passenger coach and the all-steel mail car, constructed under Mr. McKeen, are marvels of practicability and economy, not only of money in construction, but of life in case of accident. In the design of the passenger coach a wide departure is made from the old style conventional coach. A decrease in height from rail to roof of twenty-four inches marks a very noticeable change from the regular equipment. The usual form of square wooden sash has been discarded for a circular aluminum sash with a twenty-four-inch glass. The four entrances, steps and end vestibule of the ordinary coach have been discarded and a single vestibule at the center of the car with an entrance on each side has been adopted. This coach weighs but 89,250 pounds – much less than a common coach and practically no wood Is used in its construction. Everything in it is fireproof. The steel postal car designed by Mr. McKeen was turned out April 12, 1907. A special feature of this car is Its round roof and ventilation system. The latter consists of suction ventilators in the roof which exhaust the foul air. The actual weight of this car Is only 116,900 pounds. An army of weeds had vernally assailed the Union Pacific tracks and McKeen was appointed the David to go against the invaders Thereupon he called to his aid the forces of fire, designed his famous , weed burner, which passes along the track with a blistering flame and desiccates twenty-five miles of weeds in eight hours, a task which It would take 300 men with scythes a day to accomplish, and then the job wouldn’t be nearly as well done as the weed burner does It. McKeen and his men have also made important Improvements on the compound locomotive, bringing It to a successful state of development. In his handsome, elegantly appointed and perfectly tidy office there are several sentiments hanging on the walls and standing on the table and desk. A card on the table says: “An ounce of loyalty is worth a pound of cleverness.” One on the wall says: “Success Is the result of a mental activity. The right mental activity will bring success in everything you undertake.” Another pithy apothegm declares: “Many a man looking for sympathy needs really two swift kicks.” The latter is not as heartless as might seem. It Is the sentiment of strong men of independence and self-reliance with red corpuscles in their blood and iron in their muscles, men as far removed from whining weaklings as heaven from hell. His Home Life Mr. McKeen in 1893 married Miss Elizabeth New, daughter of the late John C. New, who became famous as the editor and proprietor of the Indianapolis Journal and who was United States consul general at London, England, during the administration of President Harrison. Mrs. McKeen is also a sister of Harry C. New, vice chairman of the republican national committee. Mr. McKeen is devoted the outdoor sport. He loves fresh air for himself as well as for his men. Automobiling, tennis and baseball are his particular hobbies. He Is a member of the Masons, Elks and Scottish Rites ledges and of the Omaha club and the Country club. In 1896 the Rose Polytechnic institute conferred on him the degree of Master of Science and that of Mechanical Engineer the following year. He is a member of the Master Mechanics and the Master Car Builders’ associations, serving on prominent committees. This calm, cool, carefully-dressed man who seems to have nothing to do but loll easily in his chair and play with the paper cutter is not only superintendent of motive power and machinery for the great Harriman systems, with thousands of men under him, he Is also head of the Inspecting bureau, which inspects annually more than $25,000,000 worth of railroad material. He Is also chairman of the committee of superintendents of motive power. The McKeen Motor Car company Is the name of the new corporation just formed for manufacturing motor cars of the McKeen design in Omaha for use on any roads that want them. Mr. McKeen will be president and general manager of the new company and Mr. Harriman will be the financial head. The present motor car manufacturer will be enlarged as the stow in demand for the cars makes necessary. We’d like to thank http://fultonhistory.com/ for providing a database full of great articles on not only McKeen, but also his railcars.